Which high-resolution full-frame mirrorless camera should you choose? After what's seemed like months of leaks, rumors and speculation the Nikon Z7 full-frame mirrorless camera has finally arrived. Featuring an array of tempting features, and with Nikon claiming this to be the company's most important launch since the original Nikon F in 1959, it's no wonder it's got the camera world incredibly excited. But how does the Z7 compare to the camera that's likely to be its chief rival: the Sony Alpha A7R III, Sony's own high-resolution full-frame mirrorless camera. To help answer that question we’ve put the two cameras head to head, comparing them across a variety of key categories, from resolution to performance and beyond. Both the Nikon Z7 and Sony Alpha A7R III use cutting-edge back-illuminated sensor designs, with the Z7's 45.7MP pixel count just edging out the Alpha A7R III's resolution of 42.2MP. The difference in pixel count is negligible though, and while we're yet to fully test the sensor in the Z7 we're not expecting it to be a million miles away in performance from the 45.7MP full-frame sensor in the Nikon D850 – and if that's the case we can expect results to match the spectacular image quality the A7R III is capable of producing. You'll have to take pixel-peeping to a whole new level if you're going to spot any marked differences between the two. Both of these cameras feature sophisticated hybrid on-chip phase detection and contrast AF systems. Nikon's Z7 gets 493 phase detection AF points covering 90% of the image area, while the A7R III has 399 phase detection points over 68% of the image area. That's not the whole story though. We're yet to put the Z7's autofocus system through its paces, having only tested it briefly prior to launch, but the Alpha A7R III does have one clever trick up its sleeve: EyeAF. A huge benefit for portrait and social photographers, EyeAF finds your subject's eye, locks on and will maintain focus should it move within the frame. Clever stuff. The Nikon Z7 can shoot at a fast 9fps, bettering the D850's 7fps burst shooting speed. However, this is marginally bettered by the Sony Alpha A7R III's 10fps. Both the Nikon Z7 and Sony Alpha A7R III have 0.5-inch electronic viewfinders (EVF), with both featuring high-resolution 3.6-million dot displays and fast 60p refresh rates. 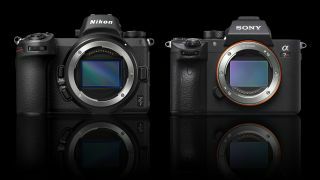 There are some subtle differences however, with the EVF on the Alpha A7R III featuring a magnification of 0.78x compared to the Z7's 0.80x, while Nikon boasts that its own optics have been used for even great clarity. Will you notice the difference? In isolation, probably not, but if you were to compare them side by side then the Z7's EVF just has the edge. While the Alpha A7R III features a 3.0-inch tilting touchscreen with a 1,440,000 dot resolution, the Z7's 3.2-inch tilting touchscreen with a 2,100,000 dot resolution edges it out. There's not much to choose between the two when it comes to the crispness of the display, but it's in how the touchscreen interfaces have been integrated into the cameras that the real differences lie. While the A7R III's touchscreen control is limited to focus selection, triggering the shutter (by tapping the screen) and reviewing images, the Z7's touchscreen integration goes much further, allowing for navigation of the menu and selection of settings. Of the two cameras, it's the Alpha A7R III that has the more compact design, measuring 126.9 x 73.7 x 95.6mm (w x d x h), compared to the Z's 134 x 67.5 x 100.5mm. The depth of the Z7 is a little deceptive as it has a larger handgrip than the A7R III. Weight-wise, again there's not much to choose between them, with the Alpha A7R III weighing 657g and the Z7 tipping the scales at 675g. Both cameras feature tough and durable magnesium alloy front, back and top covers, and both have weather seals to protect them from the elements. As far as top-line video specs go, both cameras can shoot 4K video at up to 30p, while both offer a range of lower-resolution recording options at faster frame rates. Both also feature ports for attaching an external microphone and headphones. While Sony is currently the only manufacturer of XQD cards (which offer blisteringly fast read/write speeds and high-capacity storage), it's shunned the XQD format for its own Alpha A7R III, instead opting for dual SD card slots, with only one of those supporting the faster UHS-II type cards. The Nikon Z7, by contrast, has just a single XQD card slot. The idea is that Z7 users will be able to leverage the performance of future CFExpress cards once they become more widely available. Never heard of CFExpress cards? Don't worry, they feature the same exterior design as XQD memory cards, but with even greater performance capabilities, while it's expected (and hoped) that there will be wider manufacturer support. Interestingly, while the Z7 uses a newer version of the EN-EL15a battery that powers the D850 and delivers a 1,840-shot battery life in that camera, the EN-EL15b in the Z7 is only good for a very modest 330 shots. That said, apparently in real-world use you're more likely to get around 600 shots, though we'll have to put that to the test ourselves. The Alpha A7R III uses Sony's latest NP-FZ100 battery, with a 530-shot battery life, so on paper at least it has the upper hand over the Z7 here.